It is no secret that our family loves pancakes. I have mentioned before how we ate pancakes almost every Sunday evening for four straight years. My boys devour pancakes. 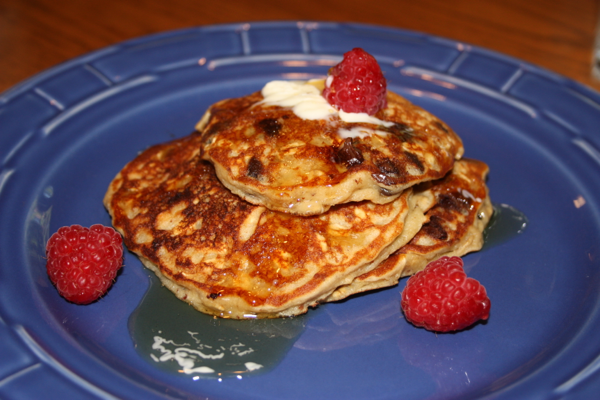 I am always looking for ways to boost the nutritional value of them so when I saw this recipe for oatmeal pancakes I was quite intrigued. I quickly bookmarked them for a future meal. I then realized I had leftover cottage cheese in my refrigerator so I knew this would make an excellent dinner. I was right. They were super tasty and filling. 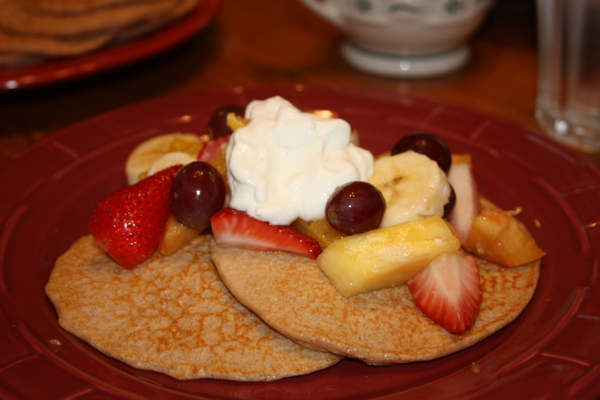 Jeffrey and I decided we would boost our fruit intake and topped our pancakes with an assortment of fruit and a dollop of greek yogurt sweetened with a touch of honey. They were exceptional. These will be on a regular rotation at our house. This recipe makes two to three servings, so if you have hungry boys like me, you will probably want to double the recipe. In a blender, blend all ingredients until smooth. The mixture batter will be quite thin. (I let mine sit while I cooked bacon and it seemed to thicken a bit.) Heat a griddle or large non-stick skillet over medium-low heat. Spray with non-stick cooking spray. For each pancake pour about 1/4 cup of batter onto griddle. Flip when the bubbles that are forming start to pop. Cook until golden brown. Repeat until you have used up all of your batter, spraying the griddle as needed. 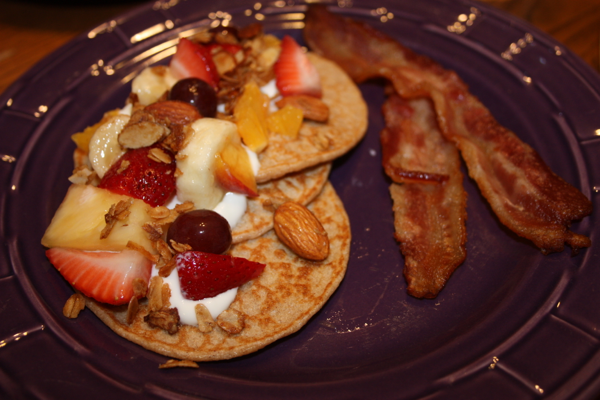 Jeffrey's pancakes topped with coconut almond granola. Adapted from Biggest Loser Recipes. 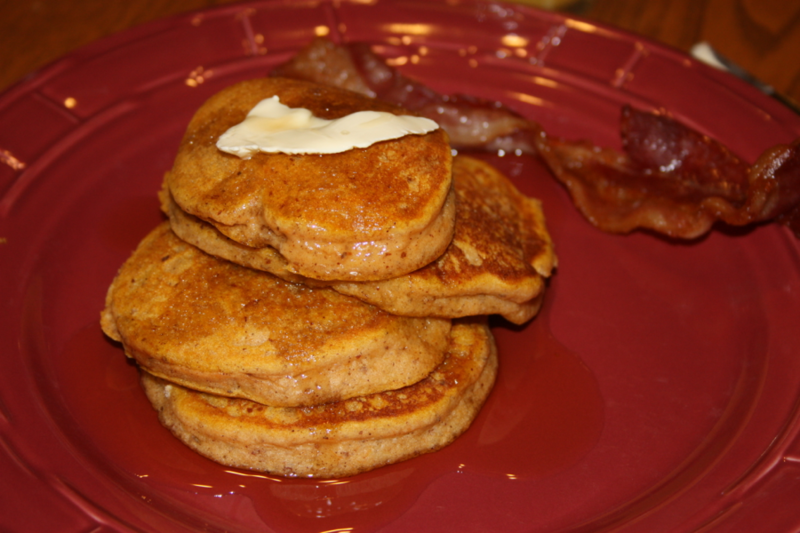 One Comment on "Oatmeal Pancakes"
Great recipe – made it this morning. Low in weight watchers points+ values too.